Jurassic Park hit theaters way back in 1993 at just the right time — Michael Crichton’s novel, which had become an instant bestseller three years earlier, was perfect for film and big-budget blockbusters hadn’t yet become over-saturated in CGI effects. Much has changed since then, so much so that one has to ask how a premise as seemingly quaint as dinosaurs run amok in the modern world can capture an audience in the age of billion-dollar blockbusters, especially after two lackluster sequels put the franchise on the verge of extinction (pun very much intended). 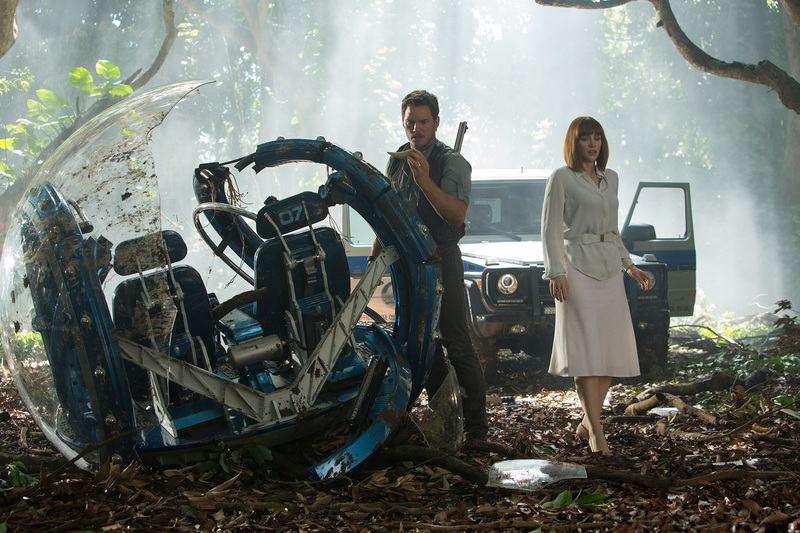 Jurassic World builds its plot around that notion rather cleverly; unfortunately, it doesn’t offer much of an answer. The bare bones of a revival are there, but the vast sense of wonderment that powered the first film is missing. Jurassic World ignores the sequels but riffs heavily on the original: The old-fashioned Disneyland-esque theme park created by a well-meaning rich man has been purchased and rebuilt as a sprawling, island-spanning Disney World-esque resort worth billions by Siman Masrani (Irrfan Khan), a surprisingly naive businessman even by mad science movie standards. Just as throwing CG-rendered dinosaurs on the screen isn’t a huge draw for audiences, the novelty of resurrecting extinct animals has lost some of its “wow” factor for the park, and visitor attendance only spikes when a new species is revived. To satisfy consumer craving for bigger and better product, Masrani has ordered park scientists to cook up something “bigger, louder, with more teeth”, a genetic hybrid with the focus group-tested moniker Indominus rex. Of course, this being a blockbuster about the perils of science gone awry, it isn’t long before the I. rex — smarter and more vicious than most dinosaurs, and possibly a little psychotic — is loose and eating tourists in exactly the same way that animatronic pirates of the Caribbean don’t. The darn thing is truly scary as hell, but it lacks the personality of the series’ signature Tyrannosaurus rex, which makes a welcome third-act appearance. The human characters aren’t developed much, either. The park’s operations manager Claire Dearing (Bryce Dallas Howard) is a generic Hollywood representation of a career woman: a career-driven workaholic who can’t seem to make room in her life for that ultimate level of fulfillment, a man and children. Said man is animal trainer Owen Grady (Chris Pratt), a self-styled raptor whisperer and stock Guy Who Warns Them Not to Do Something and Then Saves the Day When They Stupidly Do It Anyway. Ty Simpkins and Nick Robinson play Claire’s nephews, sent to the park while their parents covertly work on a divorce, who exist to remind their aunt of the joys of family in between bouts of dino-related peril. Vincent D’Onofrio is enjoyable sleazy as a shady military contractor who gets whacked too soon after his true motivations are revealed. It’s dry material, except maybe for Pratt, who gets to play upon his dual strengths of cocky leading man and comic relief; however, there isn’t enough of the latter to make the heavy-handed consumer commentary go down smoother, mainly because director Colin Treverrow (Safety Not Guaranteed) and co-writers Rick Jaffa, Amanda Silver, and Derek Connolly pass up a ripe opportunity for a little satire. It comes close every time someone’s contingency plan falls apart and things go from bad to godawful in the blink of an eye, but the action beats are a little predictable, and too often hammered home by Michael Giacchino’s overbearing score. As is often the case with corporate product, Jurassic World plays safely within the Jurassic Park formula when what the franchise truly needs for a successful revival is to be turned on its ear. Naturally, the door is left open for a sequel. Please, please, please let it be Dawn of the Planet of the Dinosaurs.